ABAP output developers or SAP programmers as well as consultants frequently require to display all output conditions for a specific output message type. On SAP NACE transaction, it is possible to go to Condition Records for an output type. But in general, you have to query or list condition records seperately for each access sequence defined for that output message type. 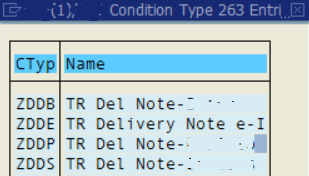 In this tutorial, I want to show ABAP developers and SAP users how to display all condition records for selected output message type on an SAP system on NACE transaction screen. First of all, launch SAP NACE transaction using SAP GUI command field aka transaction code box. Highlight the appropriate application (for example V2 for delivery documents, etc.) and press Condition records button. When the output types are listed for the related application (V1 for sales orders, V2 for deliveries, V3 for invoices basically), find your target output message type. 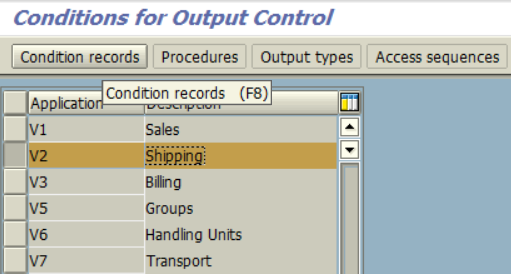 Then press Condition records or double click on the selected output message type line. 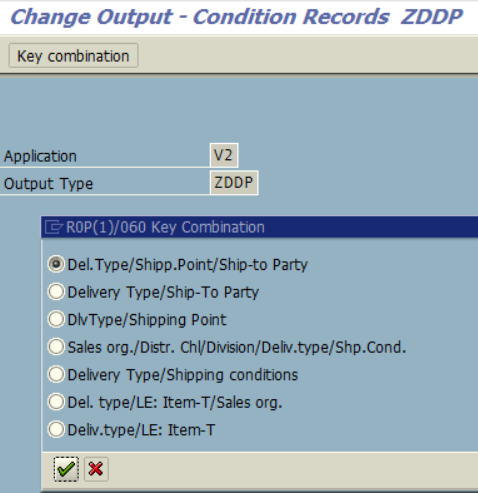 After this point, a new screen is displayed which enables SAP user to choose from access sequences (key combinations) defined for that output message. As you see on sample output message, there are 7 access sequences created or combined. So I have to check all 7 one by one if required. Because this is not a practical way, I'ld like to reach all condition records on a single screen. Select any of the key combinations. 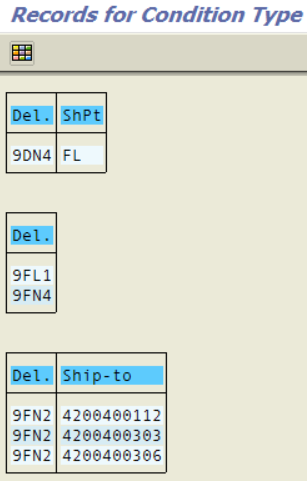 Each combination has a different selection screen to query and display defined output conditions in its table. As you see above, there may be required fields to query and list only a part of created output conditions using that access sequence. It is difficult to know the correct key field values, additionally we want to display all of the contained condition records. Any how, enter any value at required fields. But it is important, press Condition Info button at the top menu. This option will take us back to a similar screen to one which we choosed the output message type. Again select your target output message here then double click on it. A new filter screen will be displayed. Do not enter any selection criteria here. Press F8 and execute report to list all output condition records gathered from all different access sequences for the selected SAP output message type.